There are still two days left to get your entry in to win an ARC of Intertwined by Gena Showalter. Details here. I have an interview with Jacqueline Carey about the highly anticipated Santa Olivia on May 26th. The current giveaway for five copies of Santa Olivia remains open until May 28. You can enter here. 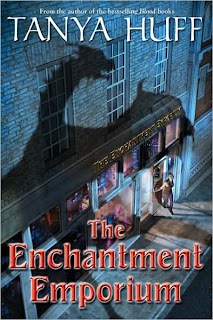 Canadian science fiction and fantasy writer Tanya Huff will be here June 4 to discuss her new urban fantasy novel The Enchantment Emporium. Tanya of course is the author of the Blood Books on which the Blood Ties television series was based. Her character Henry Fitzroy played by actor Kyle Schmid was the winner of The Ultimate Hawtest Vampire Poll at Vampire Wire. Jacqueline Carey will also returning for an interview on June 17th to discuss the upcoming release of Naamah’s Kiss, the seventh book in her Kushiel saga. The new book sounds very exciting. The Time Raiders are a group of female military members, and they all happen to be psychic. That's important because it helps them use a time travel machine (built with technology culled from the Roswell UFO crash) to visit, among other things, some of the gutsiest women in human history. Got that picture in your head? Now, hand the Time Raiders a map to twelve medallions that, when retrieved across time and combined, will form a phone of sorts to call an intergalactic council and let them know humans are ready for space travel. Throw in several forces that would dearly love to not only stop, but crush, the Time Raiders. A few of them are, in fact, out to destroy mankind. Last but certainly not least, add a bunch of extremely hot guys who can hold their own against the Time Raiders, but only until the lights go off. A Prequel eBook is coming in July followed by The Seeker by Lindsay McKenna (August 1, 2009), The Slayer by Cindy Dees (September, 2009), The Avenger by P.C. Cast (October, 2009) and finally The Protector by Merline Lovelace (November, 2009). More details are available on the Time Raiders website. The Deadline Dames have a guest posting from Anna Katherine who is giving away a signed copy of her novel Salt and Silver. You can comment over the next week until Saturday, the 30th, at midnight. They will announce the winner on Sunday. Contest is open to international readers, too. P.C. Cast and I assume Kristen Cast also will be appearing on Good Morning America Thursday, May 28th and will also be featured on Nightline that night. Katie MacAlister also mentioned she will be contributing to the August 2010 theme anthology Death’s Excellent Vacation edited by Toni L.P. Kelner and Charlaine Harris. The MacAlister story has Jim (the demon dog sidekick from the Dragon books) in human form. Jeaniene Frost (likely a Cat & Bones story) and Charlaine Harris are also contributing stories. Mandi at Smexy Books has transcript details from last weks J.R. Ward chat about Lover Avenged and other upcoming Ward projects.The New York Times did a great profile of Charlaine Harris here. A nice television interview with Nice Girls Don’t Have Fangs author Molly Harper here. Jeri Smith-Ready provided more details on her new teen urban fantasy series. The first book, Shade, will be released in hardcover from Simon Pulse on May 15, 2010. Shade will be rereleased a year later in paperback to coincide with the hardcover edition of Book Two, Shift. The series will just be known as the Shade books. Cherie Priest's has a sold the novel Bloodshot, the first novel in the Cheshire Red Reports, about a neurotic vampire/thief and her wealthy client who was blinded by a secret military project and hires her to steal back his records. Juno Books announced its release schedule for the remainder of 2009 and for 2010. 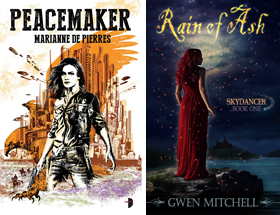 Lots of great urban fantasy titles to look forward to. And for lots more urban fantasy news for the week check out Literary Escapism. So the Time Raiders series text seems to be all about the women - and yet puts the love interests on the book covers instead. Lots of great info! I can't wait for the Tanya Huff interview. I'm so excited about her new series. That Cherie Priest sounds very interesting, too. Thanks Stacia - I made the change to my post - hopefully Juno will make the correction too. Well Tez not speaking for myself I guess they think that guys in the covers will attract the female readers - this is Harlequin and they nearly always have a guy on the cover. Thanks Renee I'm pumped about interviewing Tanya. P.C. Cast shouldn't be doing anything but writing the next House of Night novel lol. I'm actually craving the next one right now so I'm seriously thinking about re-reading them all. Great links!